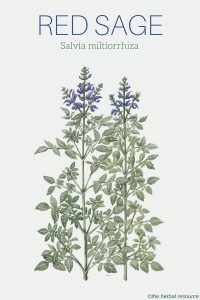 Botanical Name of Red Sage: Salvia miltiorrhiza. The plant should not be confused with poor man’s ginseng or dang shen (Codonopsis pilosula). 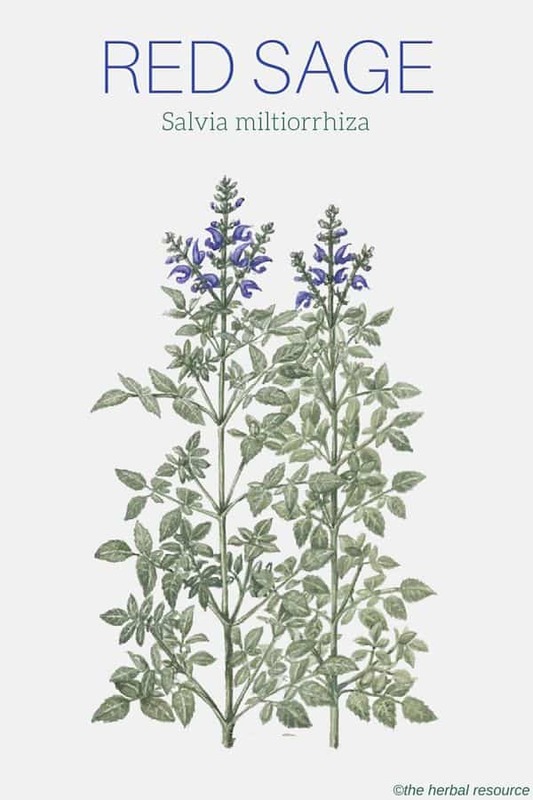 Other Common Names: Chinese sage, red-rooted sage, rødrotsalvie (Norwegian), Chinesischer Salbei or Rotwurzsalbei (German), Kinesisk salvie (Danish), dan shen (Chinese). Habitat: Red sage is native to China and Japan and is cultivated for commercial use in northeast China and Mongolia. Plant Description: Red sage is a hardy, deciduous, perennial (in cold climate) plant that belongs to the mint or deadnettle family (Lamiaceae). 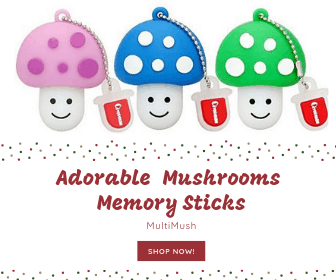 It can grow up to 80 to 100 cm in height and has branching stems with widely spaced opposite leaves. The inflorescences are terminal, axillary verticillasters and covered with hairs and sticky glands. The light purple or lavender-blue flowers grow in whorls, with 2.5 cm corollas with a dark purple calyx. The nutlets (small nuts, especially achenes) are oval to oblong and become black or dark brown when ripe. Red sage prefers moist, sandy and well-drained soil and full or half sun. It is propagated by seeds or root division. The seeds are sown indoors in March or April and germinate in 15-20 days. The seedlings are then replanted outside after the danger of night frost is over. Plant Parts Used: It is the root of red sage (dan shen) that is used for medicinal purposes. Roots of high quality are supposed to be purple black on the inside. The roots of cultivated plants from Sichuan (a province in southwest China) are often regarded to be the best and are preferred to the wild-collected roots which tend to have thinner roots. The roots are usually dug up from November to March. The first 10 days in November are considered the best for harvesting. Active Ingredient and Substances: The main active chemical constituents found in red sage are tanshinone Ⅰ, tanshinone IIa, tanshinone IIb, cryptotanshinone, isotanshinone I, isotanshinone II, isocryptotashinone, miltirone, przewaquinone A, prze-watanshinquinonetanshinol I, tanshinol II, methyltanshionate, hydroxytanshinone IIb, hydroxytanshinone Ⅱa, salviol, protocatechualdehyde, protocatechuic acid and vitamin E.
Red sage is commonly used in traditional Chinese medicine (TCM) and it has been used as a medicinal herb for more than 2000 years. In China, extensive research has been carried out on the benefits and medicinal properties of red sage. Studies have shown that the tanshinones in the herb have a positive effect on the coronary artery of the heart resulting in diminished symptoms of angina pectoris and enhanced cardiac function. The whole plant (rather than the isolated constituents) is sometimes used in China to help patients who are recovering from a heart attack or stroke, and studies indicate that the herb has a positive effect in that regard. However, clinical trials in China have shown that the plant is more effective when used preventively. Today, red sage is mostly used as an herbal remedy for ailments related to the heart and blood vessels, in a similar manner to hawthorn (Crataegus monogyna). It is often used as a treatment for high blood pressure by opening up the arteries and improving blood flow. While the herb does not directly lower blood pressure, it relaxes the blood vessels and improves the entire body’s circulatory system, which can indirectly dampen high blood pressure. In addition, the herb may be useful in treating osteoporosis. Studies indicate that one of the herb’s constituents can selectively block an enzyme known as Cathepsin K (CatK), which plays a big part when it comes to the breakdown of collagen in the bones of people suffering from osteoporosis. 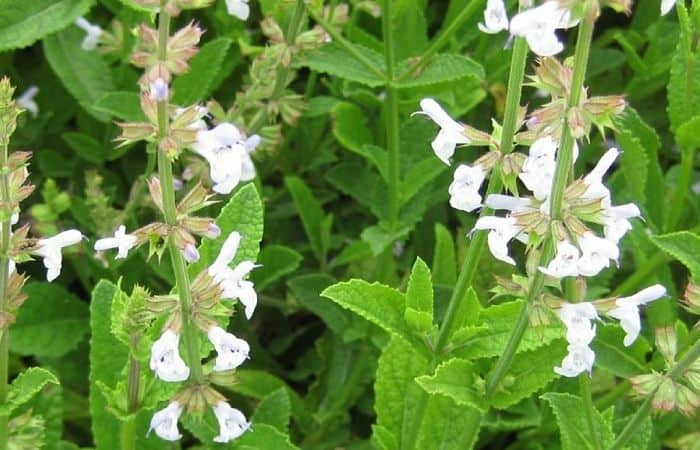 Traditionally, red sage has been used to lessen stress and ease anxiety which in turn has a favorable effect on angina pectoris, that is exacerbated by anxiety and stress. It is also used for menstrual disorders, diabetes, chronic liver disease, and insomnia caused by a rapid heartbeat and tight chest. The herb is regarded as antibacterial and anti-inflammatory and has been used as a remedy for skin conditions such as acne, psoriasis, and eczema. It is also used to relieve inflammation, lessen bruising and to speed up wound healing. Some preliminary research has shown that the herb might be useful in lowering “bad” cholesterol (LDL) and increasing the production of “good” cholesterol (HDL). Red sage is known to inhibit bacteria such as Staphylococcus (Staphylococcus aureus) and Tuberculosis (Mycobacterium tuberculosis). As a tea (infusion): Add 1/2 or 1 teaspoon of the dried herb to one cup of boiling water, steep for 15 mins and then strain. For therapeutic reasons 1 cup, three times daily is often recommended. The tea can also be used as a gargle and mouthwash as required. As a tincture: 30-60 drops, in water or juice three times daily. As a fluid extract: 15-30 drops, in water or juice three times daily. For all commercial preparations containing the herb, the manufacturer’s instructions should be followed. For those suffering from any serious cardiovascular diseases, red sage should only be administered under the guidance of a qualified healthcare provider. Tinctures made from the herb can cause upset stomach and minor skin reactions. The herb should not be used during pregnancy. Red sage has been shown to potentiate the effects of the common anticoagulation drug warfarin (Coumadin), aspirin, and nonsteroidal anti-inflammatory medications (NSAIDs), leading to increased anticoagulation and internal bleeding complications. Therefore, the herb should not be used in conjunction with these medications. New osteoporosis treatment uses traditional Chinese herb to prevent bone loss.